The APIA (Aleutian Pribilof Islands Association) has published a new book on traditional Unangan foods. I ordered the book but haven't received it yet so I can't write a review yet. 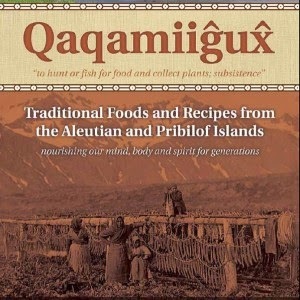 Qaqamiiĝux̂ is a compilation of the stories, experiences, recipes, and wisdom shared by elders, food preparers, and hunters from the Aleutian and Pribilof Islands Region of Alaska about the use of traditional / local foods, from the land and sea. Literally translated, qaqamiigux means to hunt or fish for food and collect plants, or subsistence, in Unangam tunuu (M. Dirks, 2014). This book is a cultural, historical, and nutritional tribute to the traditional foods from the region. Publisher: Aleutian Pribilof Islands Association, Inc. If you're interested in buying the book, here is a link to the APIA website: traditional-foods-recipes.